** FREE POSTAGE within Australia, postage overseas at cost -- Note: Postage will be added automatically when you place an order, but I will adjust the postage cost when the order is processed. ** Since 1714, the King of England was also the Elector of Hanover which at that time allowed him to participate in the choice of Holy Roman Emperor. It is therefore not surprising that British and Hanoverian troops often fought alongside each other. In the Seven Years War they shared the great victory of their Infantry regiments at Minden in 1759. When Hanover was overrun by Napoleon’s armies in 1806, their soldiers sought employment with British forces rather than fight for the Corsican. The King’s German Legion, composed of Hanoverian soldiers became one of the most effective units in Wellington’s Army. In 1816 a long peace began in Europe and Hanover became part of the German confederation. As long as the English and Hanoverian monarchs were male they ruled both countries, but on the death of William IV, Hanover separated. The scarlet uniforms worn by Hanover until 1837 were changed to Prussian blue. 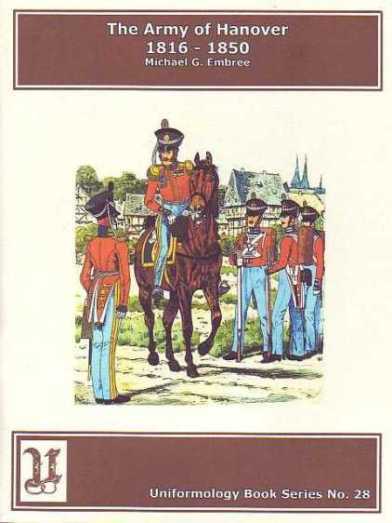 This volume follows the history of the Hanoverian Army until 1850, when a distinct difference of opinion grew between Hanover and Prussia. Their backing of Austria in 1866 led to their incorporation into Prussia, later Imperial Germany. The lively and informative text is accompanied by 20 magnificent Knötel illustrations wonderfully restored by Philip Cranz.